Wash, prick, and bake your potatoes for one hour and 15 minutes at 350 degrees. (If you’re looking for a summer BBQ recipe and don’t want to heat up your kitchen for that long, you can bake the potatoes in a crockpot.) Let them cool thoroughly or use a folded kitchen towel to hold the potato. Cut your potatoes lengthwise and use a spoon to scoop the insides into a bowl. Be sure to scrape out as much potato as you can. When potato skins are scooped out, beat together potato insides, cream cheese, butter, sour cream, half of shredded cheese, garlic, salt, pepper, and bacon. I usually use my KitchenAid, but you could use a hand mixer or just a spoon. You can beat until smooth, or you can leave some lumps for texture. Transfer potato mixture to a greased 9 x 13 dish. At this point, you can bake it and serve it, or you can refrigerate it to bake later. When you’re ready, bake at 350 degrees for 30 to 35 minutes. Sprinkle with remaining cup of cheese and bake 7-10 minutes more, or until cheese is melted. What’s your favorite summer barbeque side dish? Looking for more crowd-pleasing, crowd-feeding dishes? Try these easy green chile baked chicken taquitos or these parmesan & panko crusted baked vegetables. 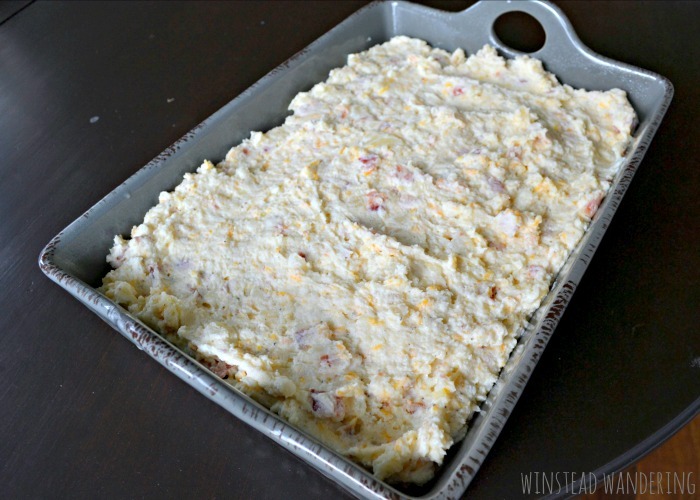 You would not regret using your cheese for this recipe! Wow, this looks SO good!!! Yum! Thanks, Kaye! It’s a hit! Thank you, Sheryl! Have a great Tuesday! Thanks! I promise it is! Pinned to my side dishes board! Looks like something we have to try soon! Thanks, Joann! You really should- and let me know what y’all think! Thank you for the feature, and thank you for hosting a fun party! I’ll definitely be there again this week! 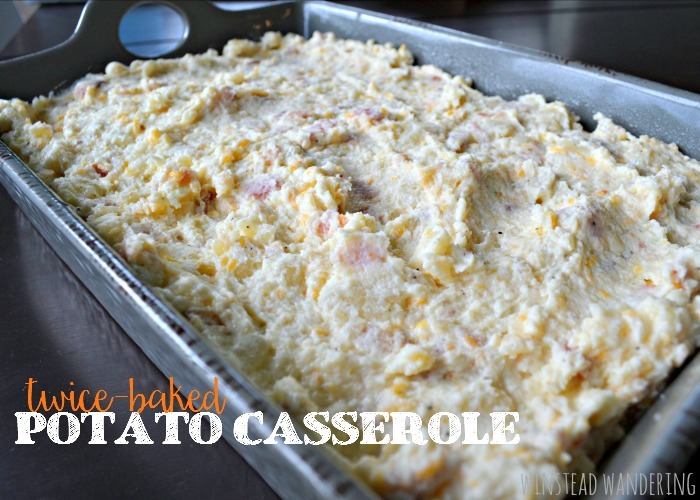 Could you use this same recipe with mashed potatoes and boiling them instead of baking them? So sorry I’m just now getting back to you, Courtney; your comment was marked as spam for some reason and I’m only now seeing it. I don’t see why you couldn’t use mashed potatoes; they only thing I can think of that would make a difference would be if you were using leftover mashed potatoes. In that case, you’d want to adjust the amounts of butter and salt and pepper you add to avoid overdoing it.